Facebook frequently makes changes to its News Feed algorithm, making organic reach a bit more challenging for brands. Of course, it’s only natural for Facebook to enhance its platform to ensure the most relevant content gets to the right people, but that also means marketers need to adapt alongside it. In other words, they need to get scrappy. To that aim, we asked our community—you—for the best Facebook hacks that make managing your workflow and growing your audience a little less taxing. From organic to paid, here are the top tips and tricks from you and your peers. Facebook Ads are a great way to connect with your audience quickly. If you haven’t started exploring Facebook advertising, now is the time start. Once you’re set up, keep your ads as conversational as possible (credit to tipper @plumblegum). 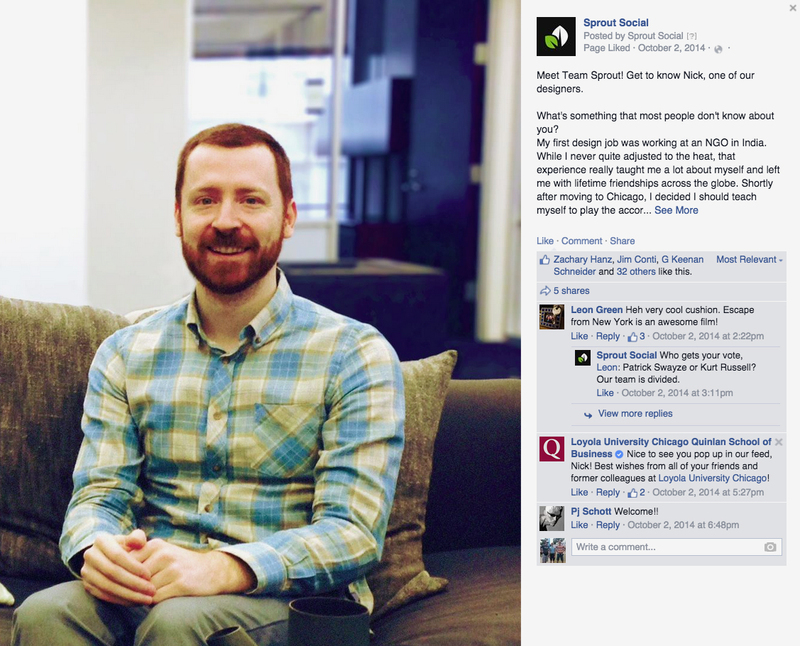 At Sprout Social, we often pose questions to generate greater engagement. Gerry Graf, Founder/Chief Creative Officer of Barton F. Graf 9000, agrees with this approach, touting the power of authenticity. Using imagery in your Facebook posts is a good way to increase engagement. But “how about using a good mixture of fonts on the brand message pic?” suggested tipper @socialzyka. This trick can help you determine what visual tone resonates best with your target audience. To get started, consider this list of the most popular web fonts (backed by data). Also, if you want to avoid breaking the bank—and who doesn’t?—here’s a list of free web fonts as well as some graphic design tips for social media. Are your images showing up blurry on Facebook? Sprout’s Darryl Villacorta (@themiddle) offers a Facebook hack that will keep those images crystal clear every time. If you need to know all the Facebook image sizes, or are having trouble with sizing images across other channels, refer to our social media image sizes guide. Go into your Facebook Page Settings. 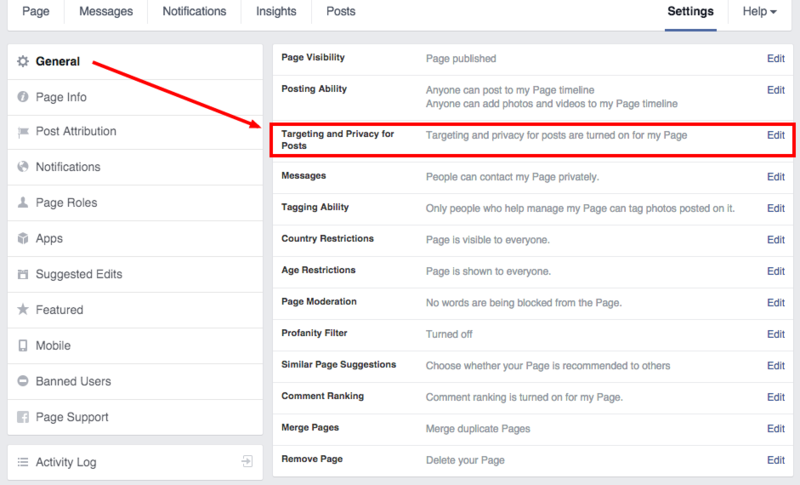 Under General, enable Targeting and Privacy for Posts. After that, you’ll see a globe icon within the field, where you enter your status. With digital marketing, it’s important to test everything you can. Facebook is no exception. 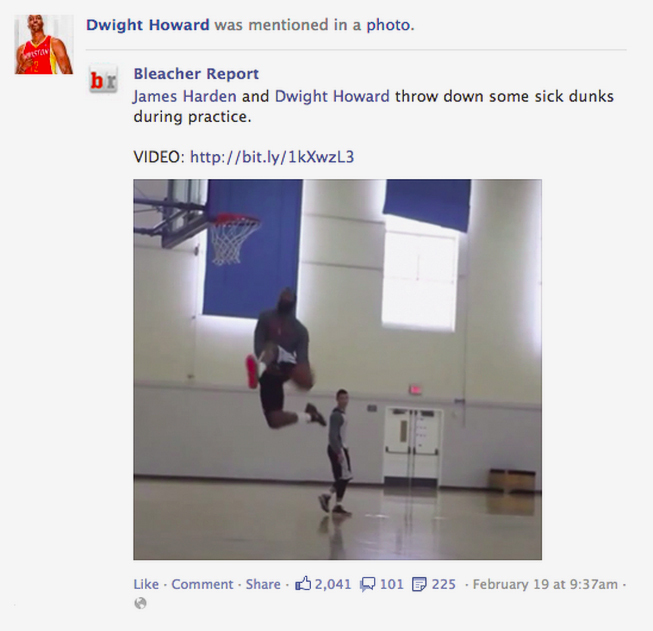 So if you want performance feedback from your Facebook posts, try turning some into Facebook Ads. You don’t need to a big budget for this either. Craig Glaser (@CraigGlaser) advocates using as little as $1 to boost your posts to a larger audience. In a nut shell, personalized posts make people more likely to click through your posts. Engagement is key on social. Whether you’re part of a big corporation or independent business, employee advocacy should be fundamental to your social strategy. Start by encouraging your employees to share relevant industry and workplace news on Facebook (credit to tipper @MarinighPR). Meanwhile, as a brand, be sure that you are not just pushing out content but that you are also actively listening and responding to your fans. With a staggering five out of six messages left unanswered on social, this could be to your competitive advantage. The right tools will help. 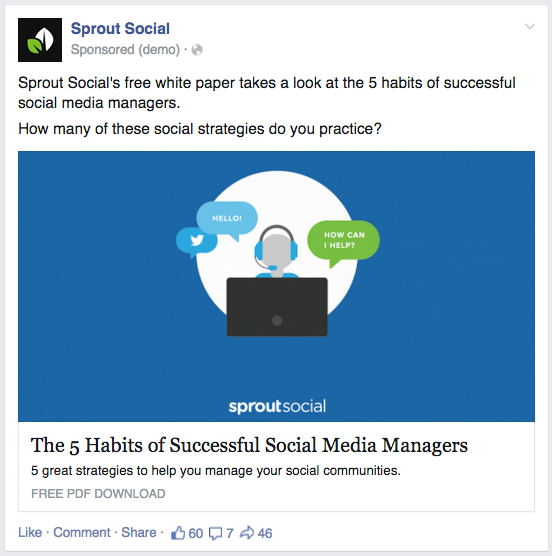 A social media management platform such as Sprout enables brands to scale their social engagement efforts and communicate with their audiences more effectively. You’ll get actionable feedback from our integrated analytics on how you can improve your strategy to expand your audience even further. Kevin King: Kevin King is the SEO Manager at Sprout Social and a film critic turned analytics geek. When he isn't poring over massive Excel files, he can be found enjoying live music, indie films and select craft beers.